One of the most important things students do in Miles Shrewsbery’s music classes at the Museum School and at Hawking Charter School is take off their shoes. This is no ordinary music class. 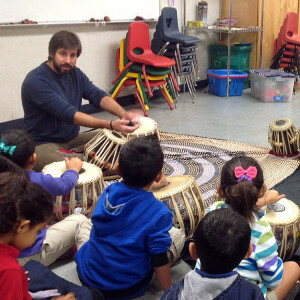 An American tabla artist and teaching artist for the Center of World Music, Miles instructs students grades K-5 how to play a North Indian percussion instrument called the tabla. 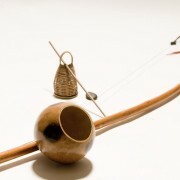 An essential part of studying the tabla, like many traditional world music instruments, is the passing on of the symbolic meaning and special significance of the instrument and its cultural origins. Miles teaches the geography of North India, its language, and the stories about the history and masters of the instrument. 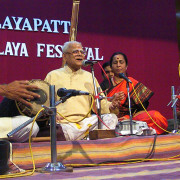 Students also learn the various customs surrounding this musical tradition. 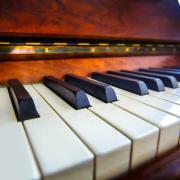 “These elements are inseparable from the music. 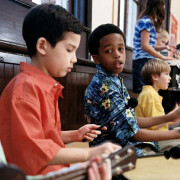 The context of music is what creates the unique feelings and expressions from a given culture,” says Miles. Miles teaches his students that playing the tabla is more than the physical act of playing the drums. It’s also about understanding a worldview — something that Miles came to realize through his own study of the tabla in India and the US. 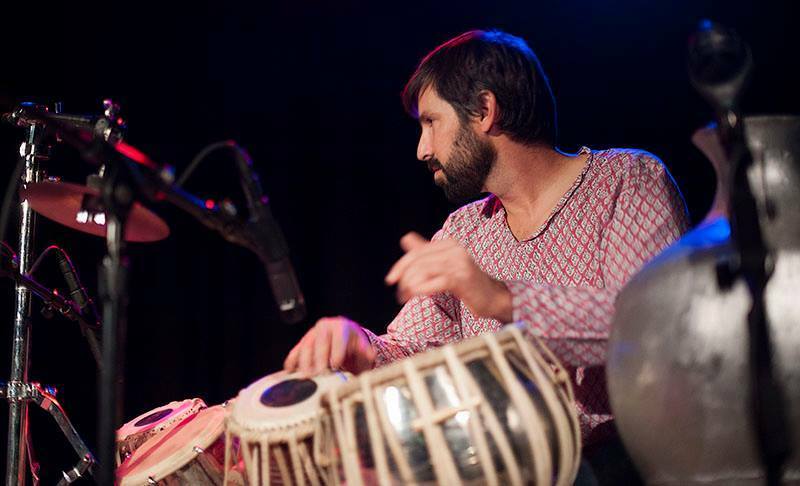 From the moment Miles first heard the tabla at age 17, “it was love at first sound.” He had an immediate connection with the instrument, even though he knew nothing about India and its culture. 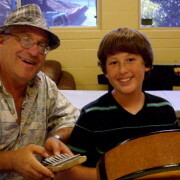 The students of the Museum School and Hawking Charter School are exposed to many of the most important skills, knowledge, and wisdom Miles has gained from his years of dedication to the tabla. Each student is now part of a long continuum of musicians who have passed down the artform within one of the oldest musical traditions in the world. Not bad for an elementary school music class. 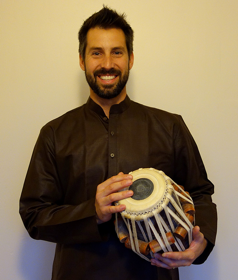 Miles Shrewsbery is an American tabla artist and disciple of Sri Abhiman Kaushal and Pandit Nandkumar Bhatlouande of Hyderabad, India, as well as a co-owner of Avaaz Records. Miles is trained in the Farukhabad Gharana of his teachers and is a respected performer of its rich, aesthetic repertoire through his years of dedicated study and practice. Miles has performed all over the world in prestigious venues such as the Symphony Space (New York City), Smithsonian Museum (Washington D.C.), Tokyo Museum of Modern Art (Tokyo, Japan), Royal Horticultural Hall (London, England), and St. Paul Cathedral (New York City). He has performed with top musicians such as Shujaat Khan, Deepak Ram, Googoosh, Cheap Trick, and Yusef Lateef. Some notable soundtracks and recordings where Miles’ tabla and percussion can be found are: Sinbad (Dreamworks 2003), The Rundown (Columbia 2003), The Riches (FX 2007), Yusef Lateef and Adam Rudolph – Into the Garden (Meta Records 2003), Dave Stringer – Divas and Devas (Spirit Voyage 2007), and Dave Stringer – Yatra (Silenzio 2011). In 2004, Miles earned a B.A. in ethnomusicology from UCLA, and in 2009, he earned an M.A. in ethnomusicology from UCR. 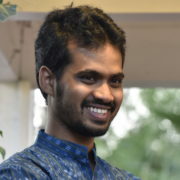 In 2012 Miles was awarded the American Institute of Indian Studies’ Senior Performing Arts Fellowship, which supported Miles to further his studies and practice in New Delhi, India for one year. 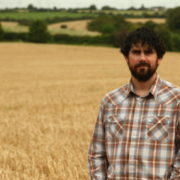 Currently, Miles is a teaching artist in residence for the Center For World Music in San Diego, California.